If you’ve watched a University of Cincinnati football or basketball game in the last two or three years, there’s a good chance you’ve seen a Wauseon graduate on the sidelines cheering for the Bearcats. Sam Gray, a 2016 graduate of Wauseon High School, is currently a junior at Cincinnati where she is majoring in Health Care Communication with a minor in Organizational Leadership and is also receiving a Public Relations certificate. Sam, the daughter of Jim and Carolyn Gray and sister to Jameson and Alexandria who currently attend Wauseon, is also a member of the University of Cincinnati Cheer Team which consists of cheering at football games, basketball games, UCA Collegiate Nationals, and many other small events throughout the school year. Her schedule for an average week includes lifting with the varsity strength coach twice a week at 6am and practices three times a week from 6-9:30pm. In between those times she goes to class from 9am-5pm every Tuesday and Thursday along with a babysitting job on Monday, Wednesday, and Friday. Obviously on top of that is the game schedule which includes football games on the weekend, basketball games during the week, and national practices that include practicing everyday of winter break. Cheering at the college level has always been a goal for Gray ever since she began cheering at the age of eight. “I decided gymnastics and other sports were not for me. My mom decided to try cheerleading after watching me do cartwheels on the soccer field and my favorite gymnastic event was easily the floor exercise”, said Gray. The college recruiting process consisted of multiple visits, many clinics and endless number of private sessions to try and prepare herself for the tryouts. “Ever since I was a little girl, being a collegiate cheerleader was always a goal for me. I visited many college cheer programs when trying to decide where I wanted to go, but they all seemed the same until I visited the University of Cincinnati. I instantly fell in love with the school, people, and the atmosphere. The team, as well as the coaches, seemed like such a family and I have never felt so welcomed by people I have never met before”, recalled Gray. Being a college cheerleader has given her the opportunity to travel with the team to various locations including tournaments, bowl games, and nationals in Orlando, Florida. 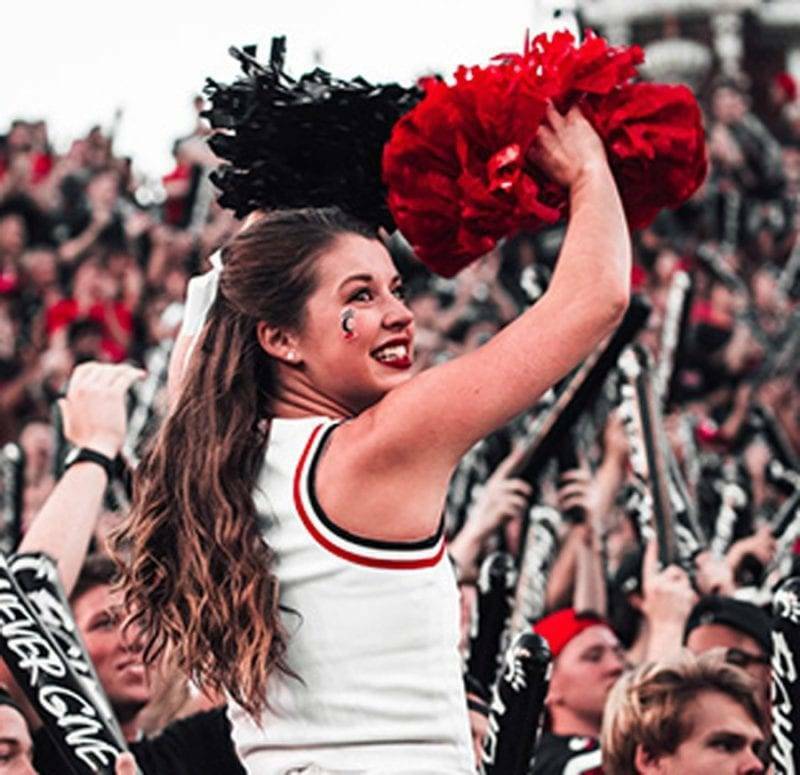 “I have so many experiences through the program that I will never forget, but the most memorable thing about being a University of Cincinnati cheerleader has been winning the first ever UCA Game Day Cheer National Championship in 2018 and the people I got to share it with. It was a thrilling experience that I will never forget”, explained Gray. When asked what advice she has for those that aspire to be college cheerleaders, Sam had some very motivational words. “Never give up. As cliché as that sounds, I had many setbacks when trying to reach my goals like anybody would. But that is what sets you apart from everyone else, the perseverance and the ability to smile through it all will take you so far with cheer and as well as everything else. The power of positive mind set is everything. Life is 10% what happens and 90% how you handle it. Your life is great, you just have to allow it to be”. So, with March Madness approaching, find a Cincinnati Bearcat basketball game on television and look for Sam on the sidelines doing what she loves to do. Be the first to comment on "Wauseon’s Sam Gray Fulfills Childhood Dream Of Collegiate Cheerleading"